Succulent, savory and tender this Easy Slow Cooker Roast Beef Recipe cooks all day long. If you’re looking for supremely tender roast beef, look no further. With only 10 minutes of prep your crock pot does all the work for you. Fork-tender meat with it’s own gravy! This post has been updated from October 2017 to improve reader experience. Easy to make tender Roast Beef made right in your slow cooker! I’m excited to bring you this recipe today! Hands down the BEST roast beef recipe I’ve ever developed and darn near ever eaten! Kid you not! This is the kind of meal when your hubby, wife, kids (you fill in the blank) comes home and says what is that amazing aroma? Is dinner ready? Let’s eat NOW!!! Yup and you get to take all the credit, but you know what’s even better? 10 minutes of prep and your work is done! And only four ingredients. Trust me this is the perfect weeknight meal! 10 minutes of prep and your slow cooker does all of the work for you! Yup four ingredients that’s it! What cut of beef is the most tender for roast? Chuck roast – either boneless or bone-in. The boneless will be more expensive. The bone-in less expensive but will have even more flavor from the bone. They are also called Top-Blade or Chuck 7-Bone Roast. Top Loin, Bottom or Top Round are also good choices. Brisket offers big beefy flavor also. How do you choose the best beef? That’s a great question! We don’t eat a whole lot of roasts in our home and because I don’t shop for it very often, I will call my folks often even face-timing my Mom so she can help me pick out good meat – true story! But here’s what I’ve learned over time. Have you heard the phrase brown food tastes good? Brown equals flavor and if you have the opportunity to brown a roast prior to putting it in the slow cooker great! With this recipe it’s just not necessary! Even better, right?!!! How long do I cook roast beef in a slow cooker? Pour beef consume soup and french onion soup over the roast. Sprinkle with the dry onion soup mix. Cover and set temperature on high. And if you’re more in the mood for something super fancy, how about Prime Rib Dinner – boy is this good beef! Remember at the beginning I talked about this being a giveaway? Well here’s the skinny! 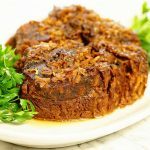 Easy Slow Cooker Roast Beef Recipe - It takes no effort to make fork tender delicious and flavorful roast beef when it's made your slow cooker! Pour beef consume soup and french onion soup over the roast. Sprinkle with the dry onion soup mix. Cover and set temperature on high - your meal will be done in 8 hours. 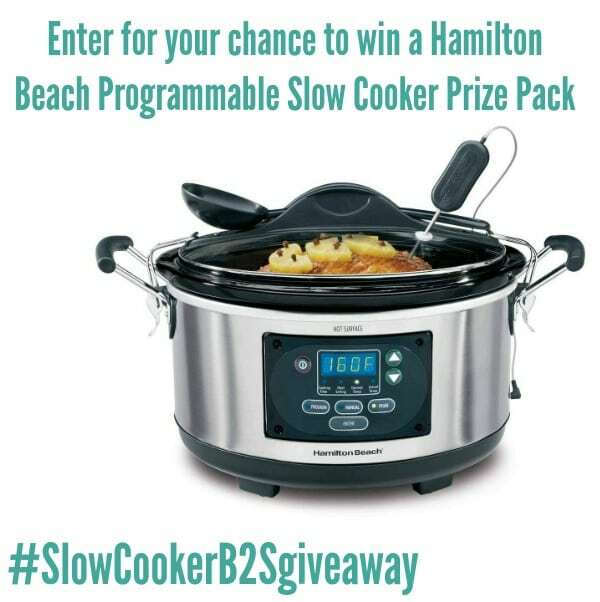 Official Rules and Conditions for the this giveaway: One winner will be receive a Hamilton Beach Slow Cooker along with a prize pack valued at approximately $100. Open to US residents adults 18+. One (1) winner will be chosen. Prize must be claimed within 48 hours of announcement or a new winner will be drawn. All entries will be verified. This giveaway is in no way associated with Facebook, Pinterest, Twitter, Instagram, Rafflecopter, Amazon, or any other entity unless otherwise specified. Giveaway ends 9/12/2018. Bloggers are not responsible for the delivery of the prize. I will be making this the next time I get a roast. Love the way it came together. Not at all Lynn, it simply gets put into the crockpot! I have the exact same problem. By the time I’m done with work I am hungry and so are my boys. They usually humor me with a few minutes of picture taking, but they rarely turn out quite like I’d like. Good enough is good enough sometimes. I do love the steam in your pictures and the beef looks delicious! Thanks Carlee! I’m glad to hear I’m not alone, sometimes it’s such a challenge. Sure appreciate you stopping by! Wow! What a wonderful comfort food meal! Looks amazing. And easy. I love the steam too. It was too easy – like too good to be that easy, if you know what I mean! You guys would love it. This looks so perfect in every way. Debra, we are the same over here. Either I take my portion down to my “photo area” – aka the basement and take photos while my family eats or I make them wait while I photograph everything and then they are moody because we’ve got a cold dinner – so sometimes I rush and I post anyway because it’s just too good not to! I’m sure the recipe speaks for it’s deliciousness and that steam photo is pretty cool! That happens to me sometimes too, Deb – I am trying to be more organised but sometimes I’m just too busy! Love this slow cooker roast beef – it looks so flavourful and tender. Thank you so much for sharing it with us at the Hearth and Soul Hop. Ahhh! 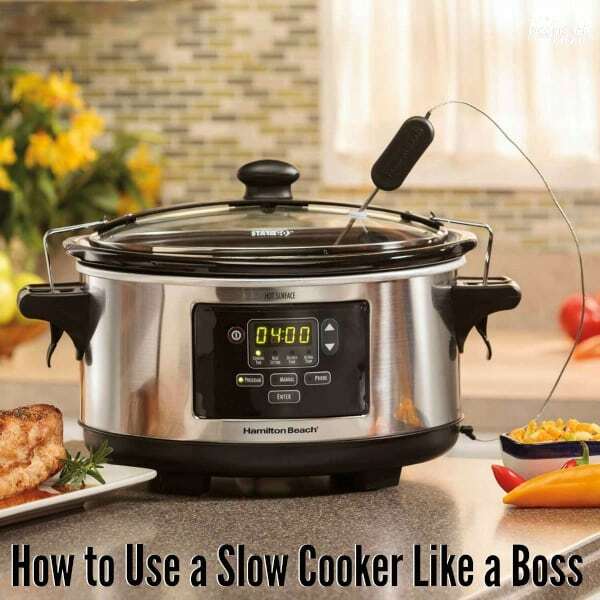 Another one bites the dust 😉 There are so many really great slow cookers out there now – it will be fun to get a new one! Super easy and super tender – I hope you enjoy this recipe! Hey Rebecca – what did you think? Too bad about the cauliflower, but tatters would be delicious also! Trying this one for the first time but I have A question: since I started it late in the ( intended to have the next day), can I set it on low for, say 12 or 16 hours? Sandy I’m so sorry for the delay in response – we’ve had a family emergency and was out of town. 12 hours would work, I would think you’d be ok at 16, but I’ve never cooked this roast that long. No problem. I hope all is well. As it turns out, 12 hours on low, then keeping warm for a couple hours did not harm the rotary at all!! It was amazing and the entire family loved it (especially my picky eater daughter). Thanks for an awesome recipe. Fabulous! Thanks for letting me know and I’m so glad your family enjoy it – yay!!! I usually cook the roast salmon on low for 8-9 hrs but I see this recipe says 8 hrs on HIGH. I will try that. Hoping my meat will come out tender not too dry. This roast beef looks SO good! Omigosh! It has me craving my grandmother’s roast (which this recipe reminds me of). Thank you Ang, I know you & the family will love this meal – enjoy!!! I would cook a beef roast of course! I actually put one in my slow cooker a few minutes ago. My version is similar to yours, although I use gravy instead of soup. I put the roast in the slow cooker, season with Trader Joe’s 21 Seasoning Salute, add 2 cans or jars of beef gravy, and then add 2 gravy cans filled with water. I put the gravy on top of the roast and pour the additional water around the roast. I cook on High for 8 hours. I think the use of gravy vs. soup makes the roast even more meltingly delicious. Leftovers – if there are any – can be used the next day in a shepherd’s pie. Oh I LOVE this recipe! 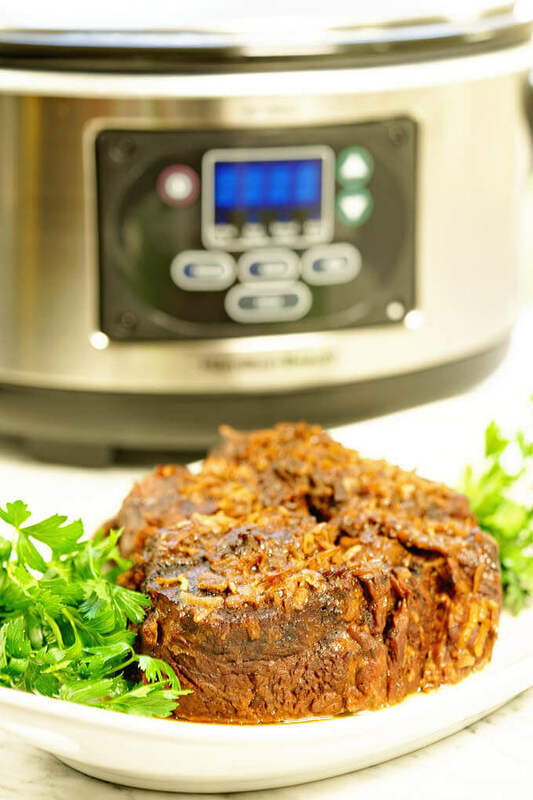 Coming up with tender beef is always a challenge and making it in a crock pot makes it so easy and effortless! I’ve GOT to make it! I had the same problem here, just struggling with getting a tender roast. You’ll love this recipe. Thank you Liza!! 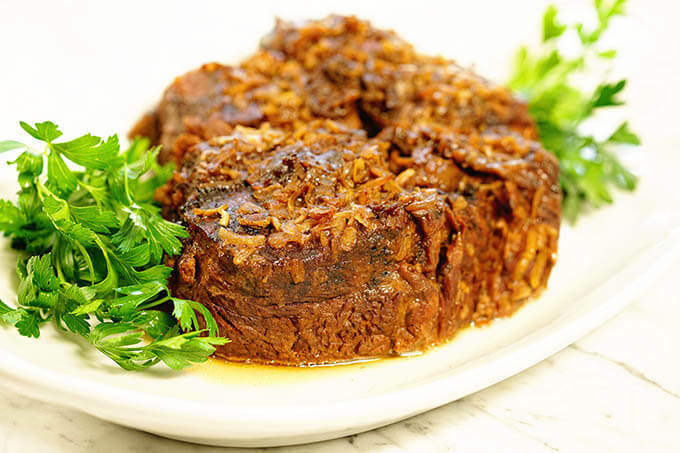 I have been looking for the perfect pot roast recipe! Mine never comes out as tender as I’d like, but I think this might just be the winner! Look no further!! This is fall-apart tender, you’ll love this meal! This roast was amazing! Going on my weekly menu plan rotation! Oooh!! Everyone loves this one, so glad you did too!!! And bring on the cooler weather and crock pot recipes! This looks great! Yes and YES, enjoy! Definitely ready to enjoy cooler days and beautiful evenings! This is pure comfort food! 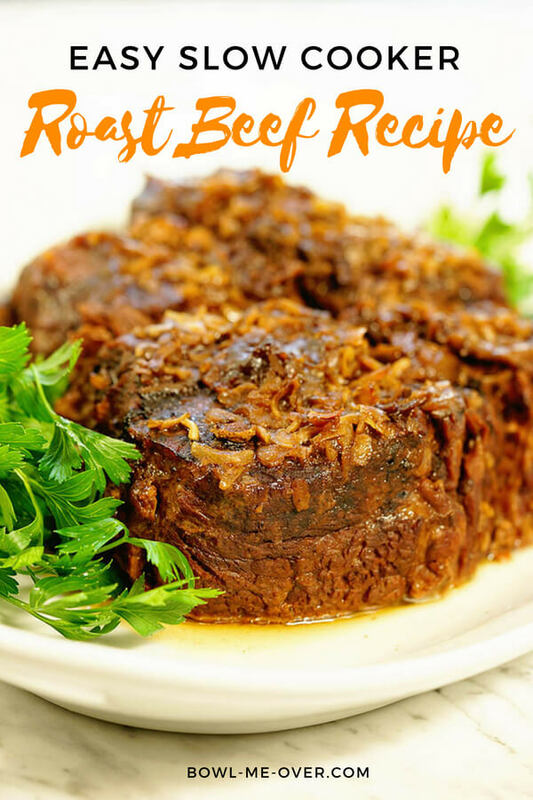 I love your step by step directions and tips, I can see we will be trying this pot roast this week! Wonderful Sandi! I know you’ll love this recipe – enjoy!!! Love the ease of this cooker. Anything to keep us from eating out! These types of recipes are my saving grace!! I love my slow cooker!! I hope you give this roast beef recipe a try Malinda! I would make this roast recipe if I won. It looks wonderful and like something my family would enjoy. Great choice Jennifer! You and your family will love it! I love roast beef and could eat it every night! I love using the leftovers for quesadillas the next day! What a wonderful idea, love that Jennifer! That sounds mighty tasty Ann! I would make a slow cooker lasagna. Now that is a fantastic idea, I will work on that recipe!! We love a good slow cooker meal around here and this one was fabulous. The roast beef was so tender and juicy! Isn’t it though? This meal is so tender and delicious! Beef stew is such a comforting meal. Great choice Antionette!